could have been launched. Fortunately, that never happened! April 24: Today, I would take my first day off from the trail. A day to play a respectable tourist in (and around) Tuscon. Amanda and I couldn't sleep in, though. No, we had places to go! I wanted to take her to the Titan Missile Museum, which is one of the most interesting places you'll ever find anywhere. I'd been there before, but Amanda hadn't and I figured she had to see the place herself! 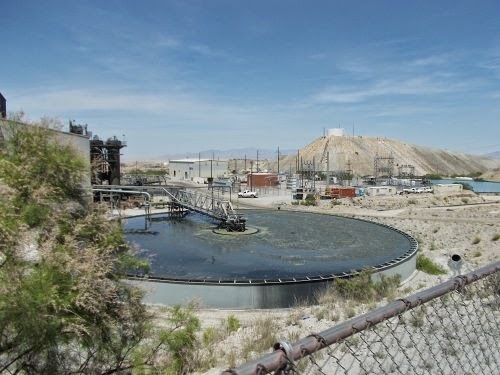 And practically right next door was the Mission Mine, an open-pit copper mine that neither of us had visited before. I don't know how I missed it when I visited the Titan Missile Museum more than a decade earlier, but I wasn't going to miss it a second time. However--we had no reservations for either of these places so we wanted to get there right when they opened to beat the crowds. So we drove into Tuscon, then south passing a bad wreck that had northbound traffic nearly stopped. Hopefully that would be cleared up before it was time to head back into Tuscon! We spent the better part of an hour looking through the visitor center and learning about copper mines, open-pit mines, and the Mission Mine complex but still had a couple of hours before our tour would begin. Near the end, the place was filling up with school kids. Not a problem, though! I figured we might still have enough time to tour the Titan Missile Museum and still make it back in time for the copper mine tour. We got back into the car and drove one more exit down the highway, following signs for the Titan Missile Museum. The parking lot there was already crowded with cars, and we crossed our fingers that tour space would be available. They had open positions for the next tour scheduled to start about 15 minutes later. The tours lasted for about an hour so we should finish and still have a half hour to get back for the copper mine tour. Perfect! I paid our tickets and we looked around the gift shop and visitors center while waiting for the tour to start. 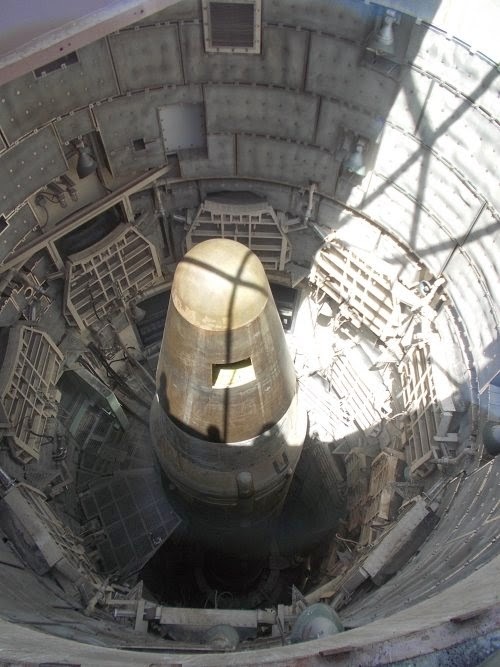 The Titan II missile in the silo. This facility was a military installation created to deter a nuclear attack. 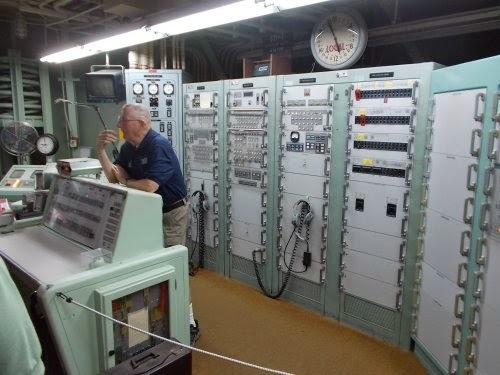 The facility became operational in 1963 and hosted a Titan II missile, the largest intercontinental ballistic missile (ICBM) ever used by the United States. It was also a setting for Star Trek: First Contact in 1996. The missile itself was depicted as the Phoenix, the first warp prototype. Our docent said that nobody was supposed to touch the missile--the oils on our skin would eventually damage it but Patrick Stewart touched it during the movie. "He wasn't supposed to touch it!" the guy told us in a mock outrage. "But what the heck--it's Star Trek!" The underground bunker was built to withstand a direct attack from missiles launched by the Soviet Union so the entire place is supported by giant springs to insulate the equipment from shock waves. 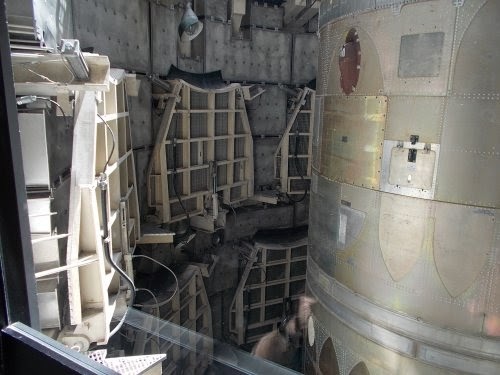 They had all sorts of procedures in place to make sure no missiles were launched by accident or without permission, and they took us through the control room where the launches would have been activated. The place is absolutely fascinating and you won't find anywhere else in the world quite like it. Fortunately for the world, the missile was never launched and the complex was decommissioned in 1982 and later turned into the museum that it is today. This was the front line of the Cold War. locations in the Soviet Union but the targets are still classified to the this day. After the tour finished, Amanda and I headed back to the Mission Mine complex for our scheduled tour there. We arrived with about 15 to 20 minutes to spare. Kids were everywhere! They multiplied like rabbits! But they were all being herded towards a few school buses and the quiet calm soon returned. At the appointed time, everyone from our tour group was herded onto a small bus and we headed to the mine itself. Our first stop was the edge of the mine--a huge, open pit spanning 2.5 miles by 1.5 miles and about 1,500 feet at its deepest. The sheer size is truly staggering. 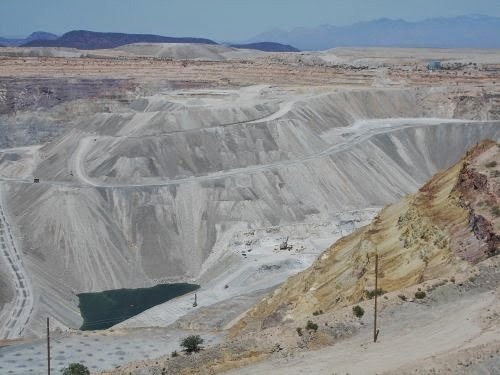 These open pit mines must be, without a doubt, some of the largest man-made holes in the world. 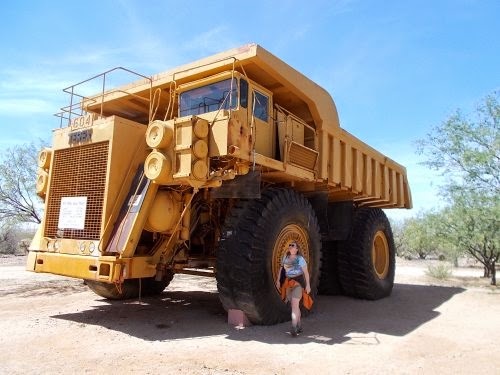 We could see giant dump trucks at the bottom which looked like ants. And these trucks were staggeringly large. These aren't highway vehicles that have to fit under bridges or stay within their lanes. These trucks tower several stories high and require climbing tall ladders for the drivers to get into the cabs. I've seen entire houses that could fit into the backs of these trucks! And they barely looked like toys from our vantage point on the edge. 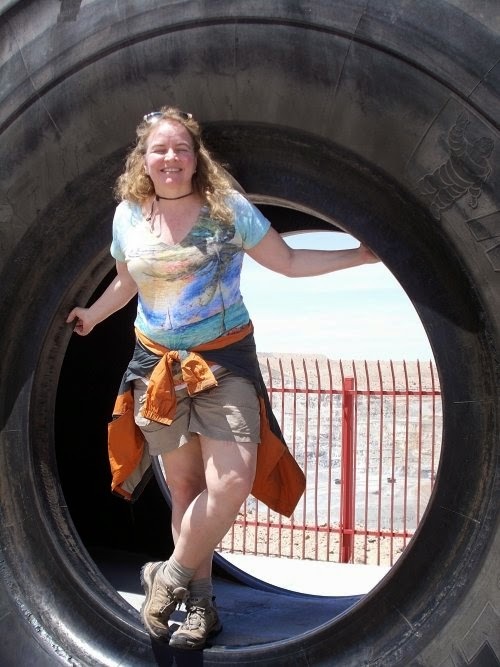 Amanda poses with a tire for one of those enormous dump trucks. We watched for a while, and I found the spectacle enthralling. 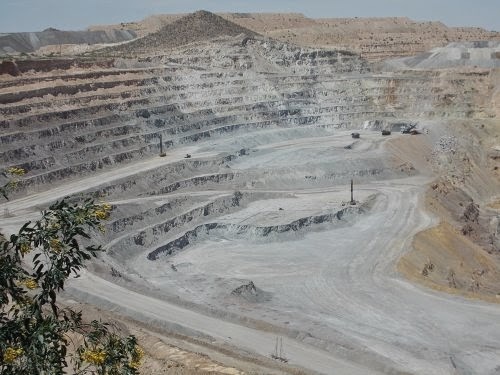 We learned some interesting statistics about the mine as well--such as how many tons of copper it extracted each year which didn't really mean much to me. They were just very large numbers! 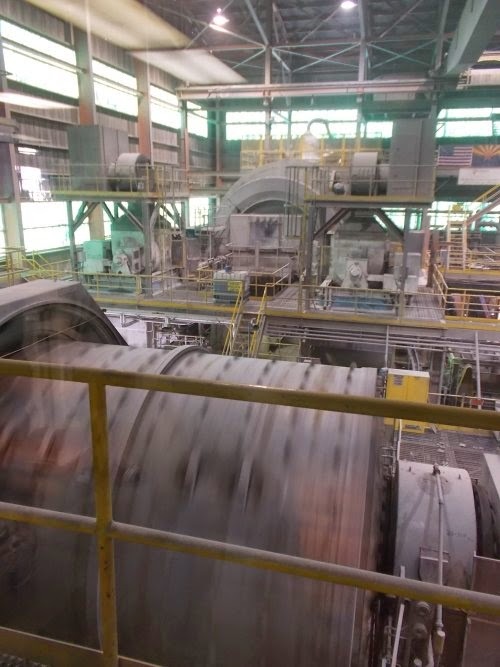 The mine runs 24/7 and for all 365 days each year. Just one tire of one of those massive vehicles costs tens of thousands of dollars and lasts only 6 months. The entire vehicle costs four million dollars and lasts for about 20 years before it needs to be replaced. Then we were all herded back into the bus and as we were driving to where they processed the ore, the driver told us that explosives were about to be detonated. He pulled over and turned off the bus. We strained to hear the radio at the front of the bus and heard "fire in the hole!" called out. Seconds later, we heard the giant explosion. It didn't sound like a giant explosion. In fact, we could barely hear it at all. The faintest of rumblings. Had we not been straining to hear it, we would have missed it completely. The ground didn't shake--at least not perceptibly--then our driver started up the bus again and continued driving. Our second stop was where the giant dump trucks carried the broken rock to. We got off the bus again and headed into a large building. Inside, we were in a small, glass-enclosed room that allowed us to see all of the machinery around the rest of the building. On one side were large rotating cylinders that broke down large boulders into particles as fine as sand. 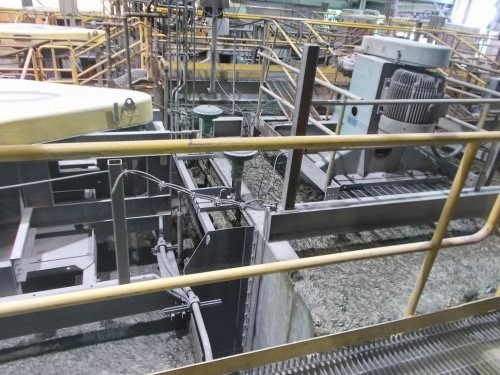 On the other side, the sand is run through an agitator with chemicals that will pull out the copper from the otherwise useless dirt and rock. near the right side are dump trucks that are several stories tall! small they barely show up as tiny dots in my photo! It's hypnotic to watch. The copper bubbles flow over the side of the tank into a trough that catches it and moves it to a settling tank. Eventually, the copper becomes 28% pure. Which doesn't actually sound like much, I know, but itrepresents less than 1% of the material extracted from the mine. At this point, the copper needs to be smelted but that's not done at the mine. The material is hauled away to a smelter in Hayden 85 miles to the north. For our purposes, this was the end of our tour and we boarded the bus back to the visitor center. From there, we didn't have any set plans for the rest of the day. The highway north back into Tucson had been cleared of the bad wreck we saw earlier so we made it back into Tucson without any hassle. We headed to REI for me to do a little shopping (I had a 20% off coupon for REI that was burning a hole in my wallet!) and ate lunch at a wonderful little place called Sir Versas. Amanda came back from the bathrooms gushing about how wonderful they were due to the unusual decorations, but she hadn't taken any photos. (Apparently, she felt weird about taking photos inside of a restroom!) I decided to make a point of checking out the restrooms before I left... then completely forgot to before we left. So... I've got no photos of the restrooms at Sir Vesas. 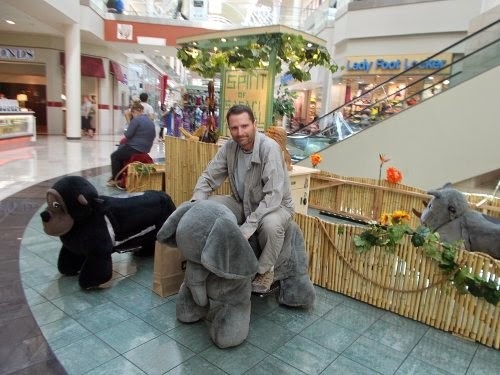 We wandered around the shopping mall a bit before eventually heading back to the hotel. Our day was done! These spinning drums grind boulders into a texture as fine as sand. These tanks that further concentrate the copper.